Gilbert coach Mark Douglass did well to keep his team in the game against a white-hot Wamogo at The Gilbert School Friday night. 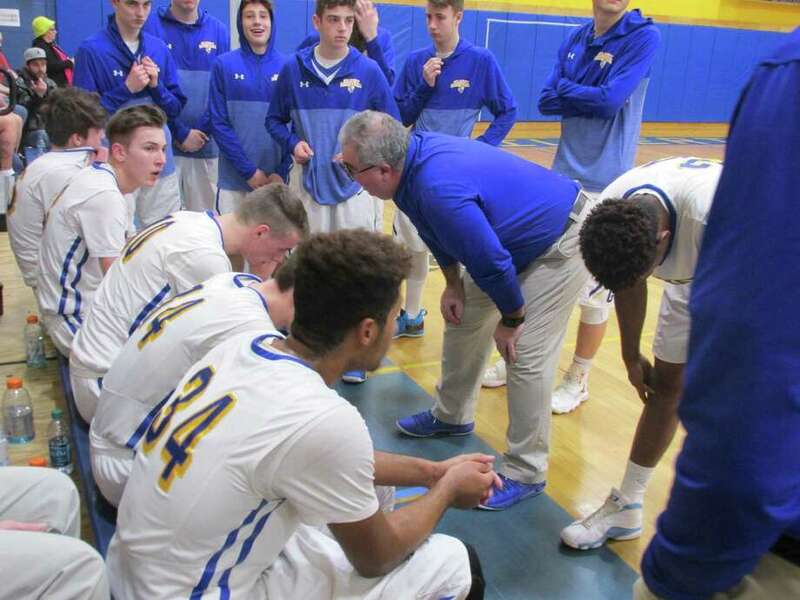 The Yellowjackets have a so-so record (6-7; 5-6 BL) but enough athletes to rise to the occasion for wins over league power Shepaug and defending league champion Northwestern. There was no rising on Friday. A lethal full-court press earned Wamogo 15 steals for the game, most of them in the first half. Three of them came in the first minute as the Warriors raced off eight straight points before the Yellowjackets got off their first shot. Athletic fast breaks and their sure-fire score were the name of the Wamogo game for the first half, leading to a 23-10 margin after the first quarter, 47-26 at the half. “All our players are athletic,” said Wamogo coach Gregg Hunt. “It’s hard to hold the score down in a game that’s that up and down. Athleticism is one thing; chemistry is another for the Warriors. Garrett Sattazahn, Wamogo’s leader, was out front for 12 of his 18 points in the first half, with time for 10 assists, 8 rebounds and 6 steals. Sean Coffee was right there with him for 10 of his 12 points, 9 assists, 6 rebounds and 5 steals. The Yellowjackets made major adjustments at the half, penetrating the press often enough in the third quarter for Dylan Crowley to lead Gilbert’s fast breaks for 6 of his 13 points, forcing the Warriors into a half-court set for most of the second half. The result? While Gilbert’s Riley Weiss (team-high 19 points) kept pace with four three’s, Wamogo shot 63 percent from beyond the arc. In the second half, the Warriors were 8-for-11 on 3s. High scorer Reid Turtoro (31 points) made all six of his three-point attempts, four of them in the second half. “They didn’t miss a shot,” marveled Gilbert coach Mark Douglass. It’s very hard to beat a team like that. Sean Coffey 6-0-12; Reid Turturo 11-3-31; Cole Higgins 0-2-2; Ethan Collins 7-1-18; Ben Roy 0-1-1; Matt Mazzarelli 2-0-4; Garrett Sattazahn 9-0-18; Eric Odenwaelder 1-0-3; Jasper Brodhead 1-0-2; Totals: 37-7-91. Joe Grugmann 3-0-6; Ryley Weiss 5-5-19; Carlos Sarmiento 1-3-6; Hunter Smith 5-0-10; Dylan Crowley 6-0-13; Juan Sarmiento 3-1-7; Totals: 23-9-61. 3-point goals: W – Turtoro 6; Collins 3; Oednwaelder. G – Weiss 4; C. Sarmiento; Crowley. Records: Wamogo 13-0; 12-0 BL. Gilbert 6-7; 5-6 BL.